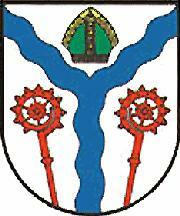 On this site is the flag and Coat of Arms of Karlino, in Białogard county, Zachodniopomorskie vojvodship. German name: Körlin an der Persante. The mitre belonged to Bishop Philip von Rehberg (17th century). I regiffed the flag of Karlino City and Commune; voj. Zachodniopomorskie; Bialogard County. The mitre is green.